“Coach is the father. Coach is a mentor. 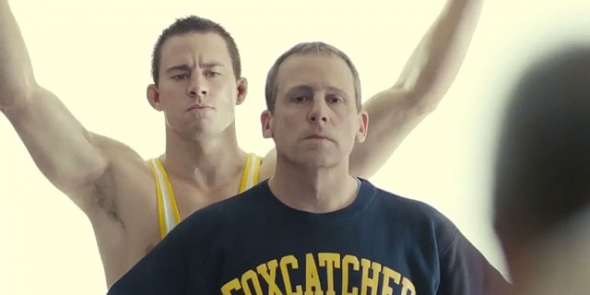 Coach has great power on athlete’s life.” These words, uttered by John du Pont (Steve Carell) in the drama Foxcatcher, echo with a slightly sinister tone in the minds of Olympic athletes Mark and Dave Schultz (played by Channing Tatum and Mark Ruffalo, respectively). The film follows the story of these two brothers, who both took home Olympic gold medals for the US Wrestling Team, as they encounter the enigmatic figure of du Pont, a millionaire wrestling fan and self-described patriot. Mark, who has long been struggling in the shadow of his older brother’s athletic achievements, is persuaded by du Pont to come and train on his private family-fun Foxcatcher Farms, in order to better prepare for the upcoming World’s Tournament and 1988 Seoul Summer Olympic Games. “I want to see America gain her roots back” du Pont says, as one of his many motivating monologues to help Mark reach another Olympic gold. Mark makes an agreement to train on Foxcatcher Farms under du Pont’s specific conditions, while Dave declines the invitation in order to spend more time with his wife and children. This creates an uneasy tension between the three characters, which ultimately escalates into one of the most bizarre true stories in recent sports history. Directed by Bennet Miller, Foxcatcher is a deeply felt character-driven drama of an inexplicably strange relationship between coach and athlete. The film was originally slated for a 2013 awards-season run, but was ultimately shelved for late 2014 due to an over-crowded awards season. Oscar contender Steve Carell (who does a complete 180 here in a play against his typical comedic types) gives a frightfully convincing portrayal of the millionaire bird aficionado. A shoe-in for this year’s Best Actor in a Leading Role, Carell is meticulously good, nailing both the mannerisms and speech patterns of the late du Pont (go watch the real du Pont’s speaking videos afterwards, and you will be in awe). For the entire running time you can tell there is something off about his character, and his increasingly off-kilter behavior grows more bizarre with each minute onscreen. Another well known comedy actor, Channing Tatum, also plays against type in a serious dramatic role. His performance is a bit more subtle than the eccentric Carell, but he effectively brings out the full physicality and explosive nature of competitive wrestling. And we can’t forget about Mark Ruffalo. The long underrated actor gets his chance to shine more than once, and 100% deserves his Best Supporting Actor nom (though it’s looking likely the Oscar will go to JK Simmons at this point). I haven’t been a huge of a fan of Miller’s work as the Academy, (both his previous films Moneyball and Capote were also Best Picture nominees) but I do think Foxcatcher is without a doubt his best film yet. The film showcases what Miller does best by taking nuanced and vulnerable characters and having them interact in unusual and explosive ways. Unfortunately, its 134 minute running time feels a little too lengthy and the action is often drawn out between ineffective long shots; shave off 20 minutes or so and you would have a near dramatic masterpiece. As it stands however, Foxcatcher is a solid film boasting some of the year’s best acting work, and will serve as a highlight and strong contender in this year’s awards season.